Larry Mullen and Adam Clayton would produce two versions of the theme which appear on the soundtrack album. Further, the album was to be released under U2’s own “Mother Records” label. Adam and Larry being in different parts of the world, started work on the track individually. They brought both working tracks back to Paramount hoping for some direction on which to finish, and Paramount requested that they finish both. The remainder of both tracks was worked on together. Recording took place in various locations, including Dublin, recording with an orchestra in London, and some work with a percussion player in New York. Both versions of the track appear on the soundtrack album, and they both appeared on the single which was also released. A video was produced for “Theme from Mission: Impossible” which featured scenes from the movie playing in a room full of televisions cut with close up shots of Adam Clayton and Larry Mullen performing the song. We also see “mug shots” of Adam and Larry being analysed by computer. Throughout the video Larry and Adam are lit in blue and red, in reference to the blue and red wires typically used in creating an explosive. One of the remixes of the song was titled, “Cut the Blue not the Red”. The soundtrack was a mix of songs inspired by the movie, and not a collection of songs that were actually in the movie. Out of the tracks appearing on the album only five tracks are actually heard in the movie, including the initial version of “Mission: Impossible” by Clayton and Mullen, the song by the Cranberries and the three tracks from Danny Elfman’s score to the movie. Many of the other acts contributing to the movie were acts with ties to Mother Records, such as Bjork and the Longpigs who recorded for the label. Also included was longtime U2 friend, Gavin Friday. Although there has been a number of sequels to the movie, none have used the Mullen / Clayton version of the theme, and on each sequel the theme has been re-recorded. The song was successful and was nominated for a Grammy Award in the category “Best Pop Instrumental Performance”. It also finished fifth in a Hot Press Readers’ Poll for “Best Irish Single”. Theme from Mission: Impossible: Music written by Lalo Schifrin. Produced and arranged by Larry Mullen and David Beal. Engineered by David Beal and Dan Gellert. Mixed by Mark ‘Spike’ Stent. Assisted by Adam Brown. String arrangement by Craig Armstrong. Percussion by Bashiri Johnson. 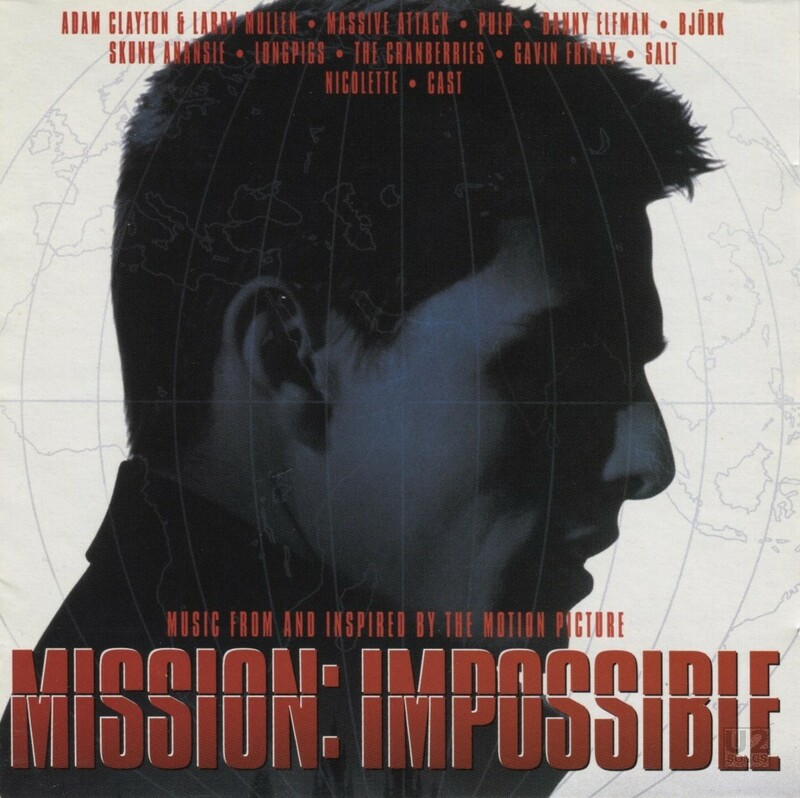 Mission: Impossible Theme (Mission Accomplished): Music written by Lalo Schifrin. Produced and arranged by Howie B.